Some TJ's trips are just about perfect. Last week, I had literally a five minute window to run in and track down the new sunflower butter cups in case Nathan didn't snag them for a review. Spoiler: he did. I ain't mad, bro, you were spot on. ...and got these apparently brand new Trader Joe's Candy Coated Chocolate Peanuts for exactly $free.99. That's right, on the house, as a gift from said cashier, because apparently I can be somewhat likeable in real life, at least occasionally. Score. So I got to enjoy the sunflower cups without the pressure of the review and focus my critical tongue squarely on these newish nutty M&M knockoffs. Really, there's not much more that can be said. There's only so many ways to get a peanut, coat it in milk chocolate, and put a candy shell on it, right? This isn't a novel concept in the least. 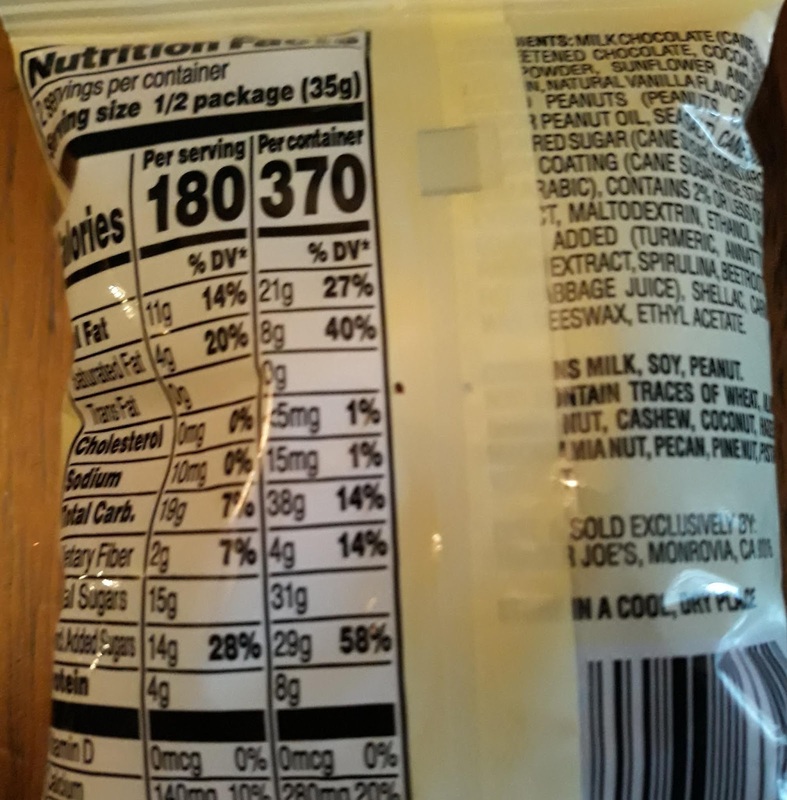 Basically, yes, but these TJ's nutty buddies taste at least a little different than the tried and true American classic. There's almost a little more freshness here, with the chocolate tasting perhaps a bit brighter, if that makes sense. It's probably just a little more sugar, but the chocolate here strikes me as being of a slightly better quality. 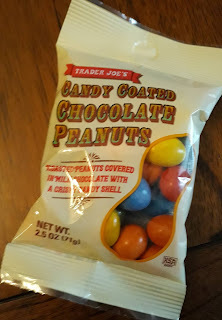 Maybe it's just the TJ's label messing with me - I think most of their chocolate products as being a notch or two above - but I swear it's different and by that I definitely mean tastier. There's a few other small differences, to be sure. Like no artificial coloring! That's also welcome. Why use some Red 40 when some good ol' beet or cabbage juice can do the trick instead? It's almost like eating salad then too, right? Right? 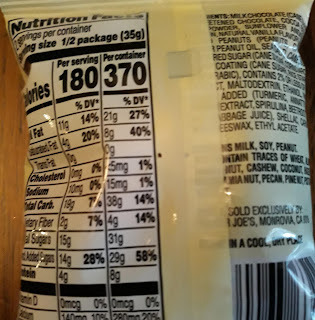 I enjoyed the chocolate peanut candies for sure, and would buy again for a quick little snacky if the need so arose. I'd probably go for those sunflower seed cups first, but for a consolation prize and a little unexpected bonus, these are a sure thing. My only wish is there'd be some sort of little twist on them somehow, like an added flavor or something kinda funky...oh well. Just 99 cents for a generous two serving bag, or if you're selfish like me, one big serving that you don't share with your wife. Gonna double my score and make it up to her for sure.